It’s all about finding that sweet spot. That time between dinner and last call when the lights go down, a little extra buzz explodes in the room and the night takes a turn for the can-you-believe-that-just-happened. And when metal grates descend over every window, sealing in the party and blocking out the city’s prying eyes. Introducing MPD, the first foray into a proper dining establishment from the Brothers Koch (of Day and Night fame), opening for private parties next week and taking reservations at this very moment in (you guessed it) the Meatpacking District. 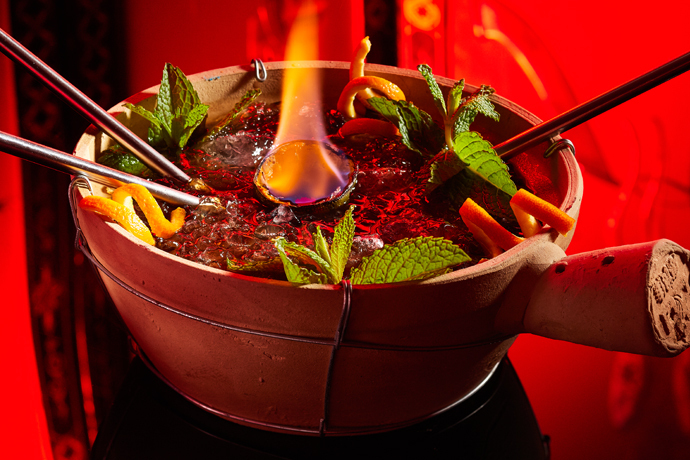 Arriving at MPD’s corner location where the High Line meets Gansevoort Street, you’ll saunter into the front bar area, ringed by high metal tables and bartenders with Boom Boom credentials, and survey the scene in the intimate-feeling dining room one step below you. It’s here that you’ll make your scene among white brick walls, red chandeliers and mocha velvet banquettes. Or else continue on to MPD’s third area, an open-air sidewalk café complete with a communal red table, where you can give 14 strangers the pleasure of your company for the evening. After dinner, you might consider lingering until around midnight (the aforementioned sweet spot), when the metal shutters descend, the speakers you’ve noticed ringing the room come to life, and the place swings from a lively Meatpacking dinner spot to metal-encased dance-and-champagne bomb shelter, complete with a late-night menu of truffled tater tots and other gourmet breakfast items.